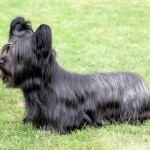 Skye Terrier is low to ground, longheaded and black nosed small dog. His teeth meet in scissors or level bite. The dog’s eyes are normally brown and dark. He has symmetrical ears that are perfectly dropped or erect. 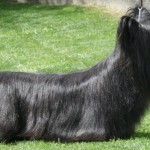 His tail hangs with plenty of feathering and is also long. The tail is pendent. It is never curled. His feet are long and large resembling those of a hare. They point straightforward. 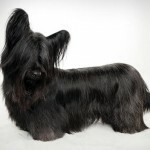 When it comes to his coat, it is double, soft, straight, wooly and has a very hard outer coat. The coat can come in an array of colors such as cream, fawn, silver platinum, light or dark gray, blue and black. Black points can be seen on the muzzle, ears and tail tip. The chest can have small white amounts. 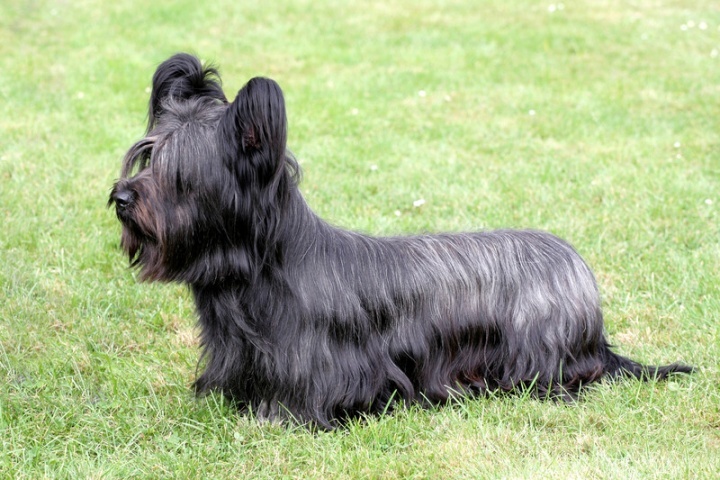 The Skye is a terrier breed, which originated over four centuries ago in Skye Isle Scotland. 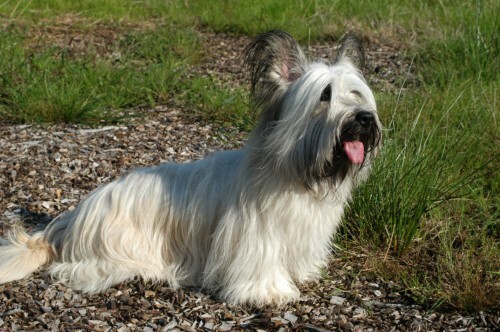 Owners mostly used this dog for hunting of otter, fox, and badger. The dog followed these animals right into their burrows and pulled them for preying/killing. 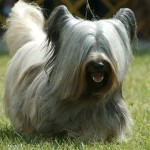 Up to this day, Skye Terrier remains quite unchanged. He uses his sturdy and short legs for digging. This double and hard coat offers protection from rough thorns, bites, and brush. The coat also protects him from harsh weather. 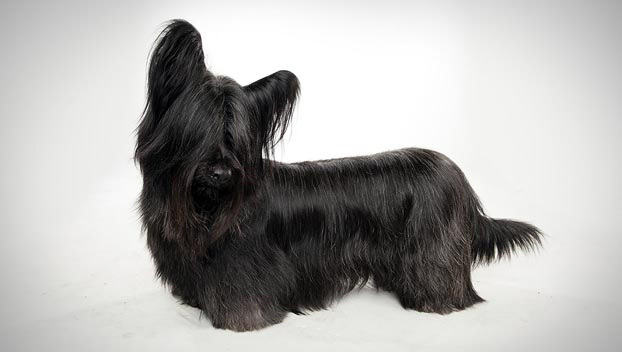 The American Kennel Club recognized this dog in 1887. 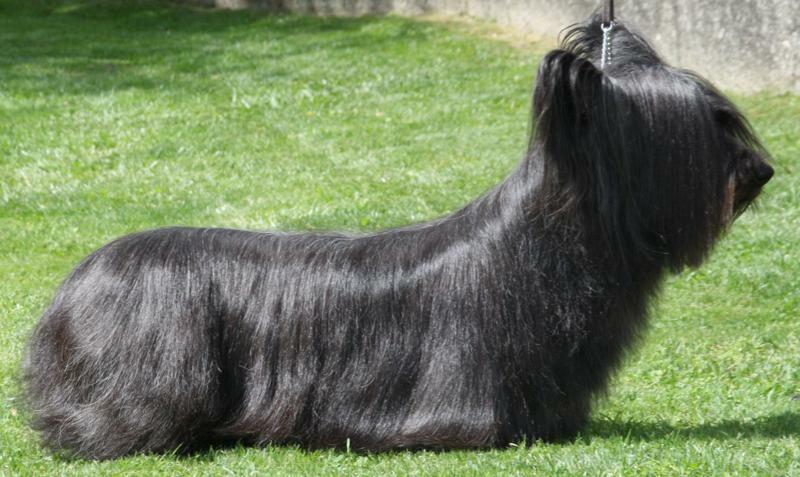 You can bet that this breed is more than healthy. Nonetheless, one issue affects the dog mostly. This has to do with orthopedic problems, which occur during growth. The fact that this dog is achondroplastic means that he brings with him large body resting on small legs. 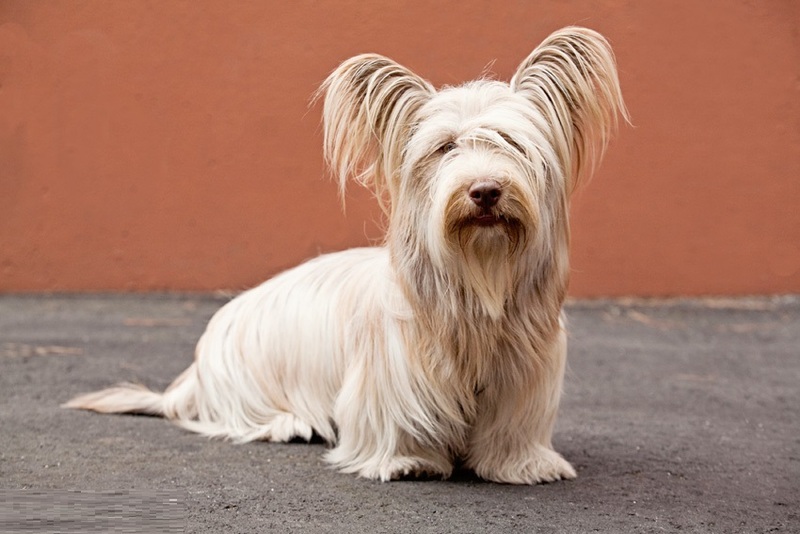 Allowing the dog to climb or jump excessively as he grows especially during puppyhood is discouraged. This is because it can result to a disorder known as premature closure. This condition takes place when there is failure of the growth plates to close properly. The best time to engage him in countless activities such as runs or walks, stair climbing and jumping would be between eighteen and twenty four months. 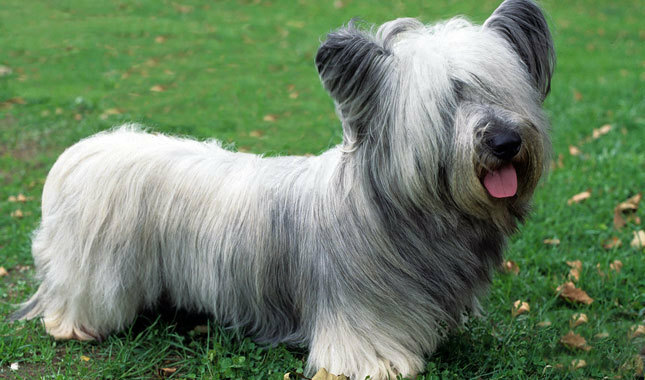 The Skye Terrier is good-natured, loyal, and brave. He is quite choosy when it comes to making friends. He prefers people that take their time when it come to approaching him. The dog is highly cautious, and reserved towards strangers. These traits or attributes explain why he is an incredible watchdog. 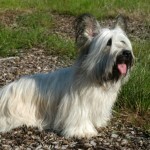 Skye is also steady, skilled, aslute and prudent. He is not very submissive. However, he is sensitive. One great attribute about him is that he has long lasting memory. You can bet that he will remember any slight mistreatment or slights. 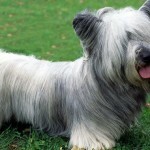 If neglected, the dog will become unhappy, willful, and bored. Simply, put, he likes to belong and feel like part of the family. Early socialization is recommended for this dog. Expose him early to experiences, people, sounds, and sights. All these goes miles in ensuring your dog becomes all rounded. Take him for walks, runs, and social parks. The dog is very easy to train. 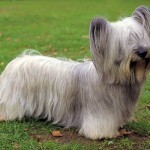 Generally, the Skye Terrier is well mannered as long as he has everything he needs. Skye is normally quite elegant. He is very cute especially on first sight. Walking with him around the city or town makes, you feel good because he is quite attractive. The ideal height is ten inches for the male and approximately nine inches for the female. Normally, he weighs twenty five to forty pounds. 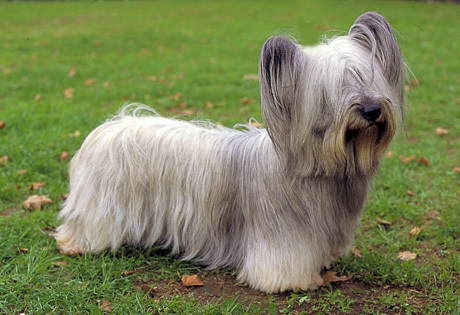 The Skye Terrier wears a stylish and elegant coat. It hangs straight and down either side right from the head to tail. 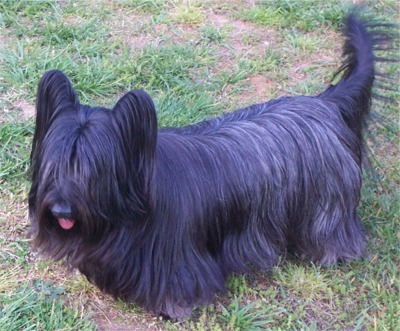 His undercoat is soft, wooly, and short. 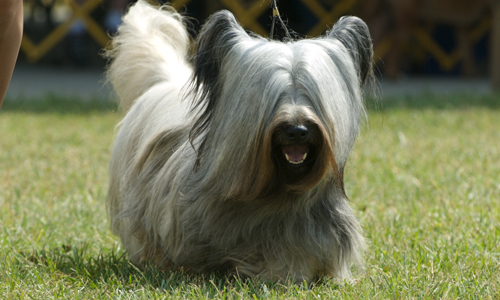 It is usually covered with outer coat of hair with hard texture. 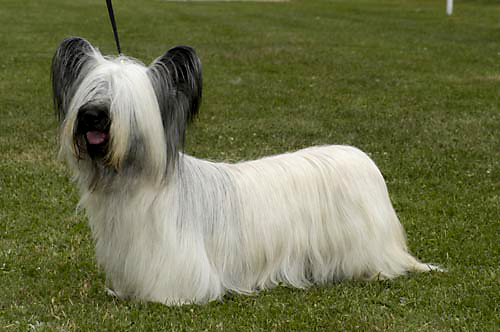 The coat can be cream, silver platinum, light, or dark gray and black in color. If you opt to keep the coat long, ensure you brush it frequently. Failure to do this will lead to mat. 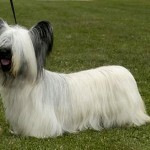 Other owners normally opt to maintain the coat short for easy maintenance. 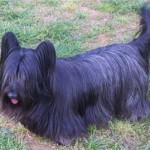 For the coming in of full adult coat, it can take a few years. The breed is average when it comes to shedding. He has a small and sturdy body. 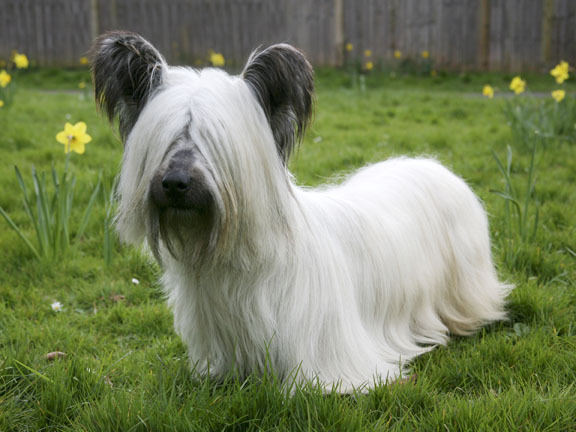 It is a NO in terms of being hypoallergenic. The dog has huge appetites thus make sure you provide plenty of food for him. His small size means he needs moderate exercises. Skye can adapt to new environments easily and thus transferring him from country home to apartment or vice versa should not be a problem. 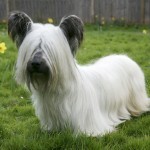 Ensure that you live with him indoors because outdoors is not the best residence for this breed. 1 3/8 – 1 7/8 cups high quality dry dog feed daily is the recommended amount of feed to provide to your dog. You can give the dog the meal twice or thrice in a day. Ensure the food is of high quality. 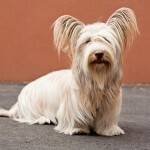 This will surely give your dog the right strengths for his activities. The average puppy price is $1500.